Are You Homeless? We are here to help! Hot Food: served daily until closed, nutritional, unlimited, including dessert. Cold Food: Ramen noodles, peanut butter, fruit, granola bars, etc. Showers: Available during open hours. Laundry: Free during open hours. Clothing/shoes: Clothing, shoes, coats, socks, underwear, hats, and gloves. 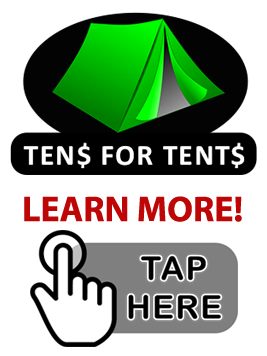 Tents/sleeping bags: We can provide for you if homeless but not allowed to sleep at overnight shelters. Transportation: Bus tickets used to encourage writing skills and education. Prescriptions/First aid: Covered when you have no insurance. Eye Glasses/ teeth extractions: Local professionals provide for you. Education: General Education Development GED’s the price is covered for you. GED tests are a group of four subject tests which, when passed, provide certification that the test taker has American or Canadian high school-level academic skills. Recovery: 16 NA/AA meeting per week are available at the center, also rides to a detox center for alcohol/drug treatment and counseling.